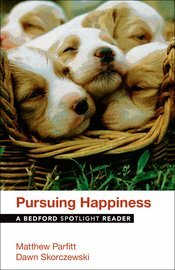 Pursuing Happiness: A Bedford Spotlight Reader explores questions around the central concept of what makes us happy: What are the spiritual traditions of happiness? What are the ethics of happiness? What is the psychology of happiness? How should we question what makes us happy? How can we make ourselves and others happy? Readings by philosophers, psychologists, spiritual leaders, ethicists, economists, and others take up these issues and more. Questions and assignments for each selection provide a range of activities for students. The Web site for the Bedford Spotlight Reader series (at bedfordstmartins.com/spotlight) offers comprehensive instructor support with sample syllabi and additional teaching resources. The Bedford Spotlight Reader series is an exciting new line of single-theme readers, each reflecting Bedford’s trademark care and quality. An editorial board of more than a dozen compositionists at schools with courses focusing on specific themes assisted in the development of the series. Each reader collects thoughtfully chosen selections sufficient for an entire writing course—about 30 pieces—to allow instructors to provide carefully developed, high-quality instruction at an affordable price. Bedford Spotlight Readers are designed to help students from all majors make sustained inquiries from multiple perspectives, opening up topics such as money, food, sustainability, and gender to critical analysis. The readers are flexibly arranged in thematic chapters, with each chapter focusing in depth on a different facet of the central topic. I am thrilled with the concept of the book. Having taught a composition course on happiness, I am convinced that the topic has relevance and interest for undergraduates.